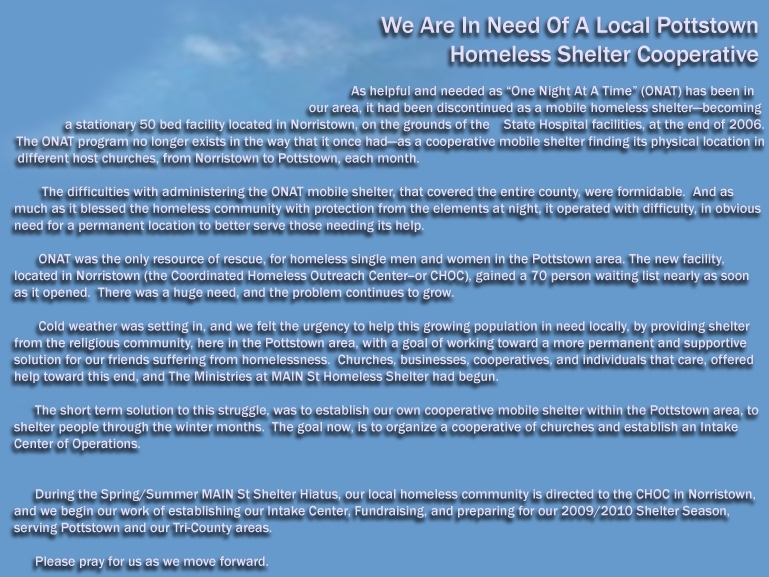 As plans develop and evolve to help, assisting people in need of shelter in this community, we will use this page to communicate how we move forward in addressing homelessness in the Pottstown area. In 2006, we suffered a flood, empting St John's Parish House basement. It was not fun, but looking to God, we saw a baptism, where the basement was cleared for another purpose--a place for the poor and homeless; a possible Intake Center for sheltering our area's homeless friends. These pictures are a snapshot of this Blessing. Our generous friends at HOME DEPOT graciously planned and helped us with converting the Parish House to our Ministry Intake Center, a home base of homeless ministrie operations, suitable for helping our most vulnerable citizens. Please call us at (610) 970-2444 for more details.